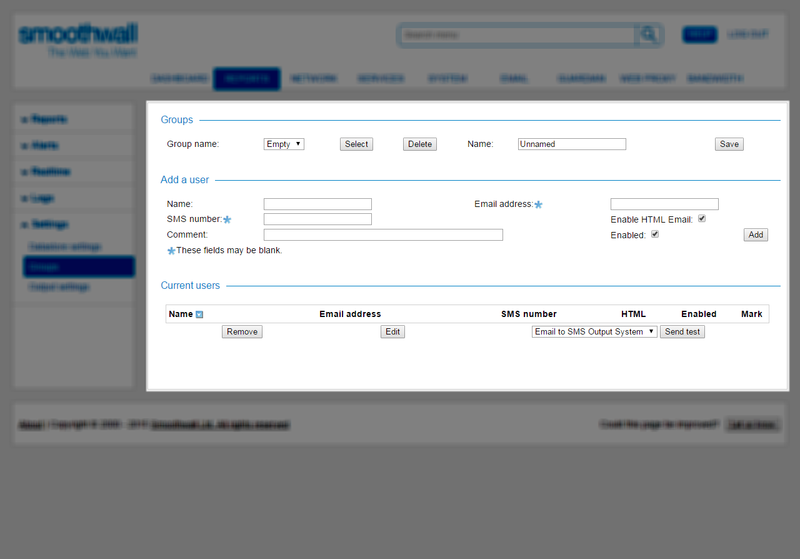 You can configure the Smoothwall System to email scheduled reports to users, or groups of users. Alerts can also be sent via email, or SMS. To be able to use the email and SMS feature, you must configure user groups, and the group members who will receive alerts and reports. 1. Go to the Reports > Settings > Groups page. • Group name — From the Group name drop-down list, select Empty and click Select. The Smoothwall System creates the group. • Enabled — Select this to enable alerts, or reports, or both to be sent to this user. The user's details will be added to the list of current users in the Current users panel. 6. You can test the configured details by selecting either Email to SMS Output System or SMTP (Email) Output System from the drop-down list at the bottom. Click Send test. For a detailed description of how to set up the Smoothwall System to send email and SMS, see Configuring Report and Alert Output Settings. 2. Choose the group that you wish to edit from the Group name drop down list. 3. Click Select to display the group. 4. Make any changes to the group using the controls in the Add a user panel. For more information about using these panels, see Configuring Alert and Report Groups. Note: Deleting a group will also delete all group members, but does not remove the users from the directory. 2. Select the group to be deleted using the Group name drop-down list.